Botanical Name: Dioscorea opposita Thunb. Part Used & Method for Pharmaceutical Preparations: The rhizomes are dug in the period of Frost's Descent (eighteenth solar term). After the rough bark has been removed, the rhizomes are cleaned and dried in either the sun or the shade. Then, they are soaked again and cut into slices. 1. Weakness of the spleen and stomach manifested as poor appetite, diarrhea and lassitude. Dioscorea (Shanyao) is used with Ginseng (Renshen), White atractylodes (Baizhu) and Poria (Fuling) in the formula Shen Ling Baizhu San. 2. Excessive dampness due to deficiency of the spleen manifested as whitish and dilute leukorrhagia and lassitude. Dioscorea (Shanyao) is used with White atractylodes (Baizhu), Poria (Fuling) and Euryale seed (Qianshi). 3. Excessive dampness transforming into heat manifested as yellow leukorrhea. 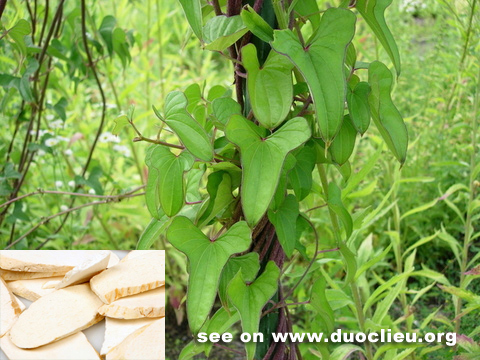 Dioscorea (Shanyao) is used with Phellodendron bark (Huangbai) and Plantain seed (Cheqianzi) in the formula Yihuang Tang. 4. Leukorrhagia due to deficient kidneys manifested as leukorrhagia and lower back pain. Dioscorea (Shanyao) is used with Dogwood fruit (Shanzhuyu) and Dadder seed (Tusizi). 5. Diabetes manifested as extreme thirst, excessive drinking, excessive food intake, profuse urination and lassitude. Dioscorea (Shanyao) is used with Astragalus root (Huangqi), Trichosanthes root (Tianhuafen), Fresh rehmannia root (Shengdihuang) and Pueraria root (Gegen) in the formula Yuye Tang. 6. Nocturnal emissions due to deficient kidneys. Dioscorea (Shanyao) is used with Dogwood fruit (Shanzhuyu) and Prepared rehmannia root (Shudihuang) in the formula Liuwei Dihuang Wan. 7. Frequent urination due to kidney deficiency. Dioscorea (Shanyao) is used with Bitter cardamom (Yizhiren) and Mantis egg case (Sangpiaoxiao). 8. Chronic cough due to deficient lungs. Dioscorea (Shanyao) is used with Glehnia root (Shashen), Ophiopogon root (Maidong) and Schisandra fruit (Wuweizi). Dosage: 10-30 g; 6-10 g (for powder). Cautions & Contraindications: This herb is contraindicated during food retention.